The ratings presented in What Works? 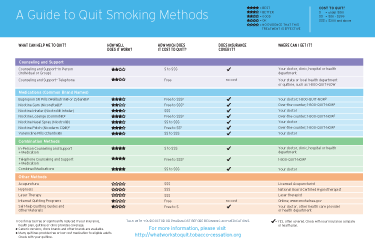 A Guide to Quit Smoking Methods are primarily based on the findings and conclusions of Treating Tobacco Use and Dependence: Clinical Practice Guideline (2008 update), sponsored by the Public Health Service (PHS). This Guideline was developed by a panel of tobacco cessation experts. The number of stars assigned to each method is based on odds ratios and estimated quit rates as determined through research studies. The number, range, and consistency of research studies on each method were also taken into account.